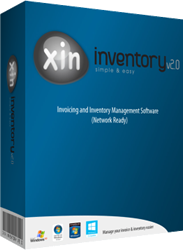 Xin Inventory 2.0 software is an network enabled software for multiple users accessibility. It is suitable for medium company who has more than one user to use the system. It inclusives of all features from Xin Invoice 3.0 and Xin Inventory 1.0. Xin Inventory 2.0 software is network enabled to support multiple users accessibility at the same time. By default, Microsoft SQL Server Express 2008 R2 will be installed. If you already have Microsoft SQL Server (2005 or 2008) installed, you may also configure the system to use your existing database. Database will be installed in a server, or any computer that serve as as database server. With some simple configuration, Xin Inventory 2.0 program installed in other client computers on the same LAN will be able to access to the database. As Xin Inventory 2.0 supports multiple users accessibility, a tighter security control is essential. Users will be grouped into different User Group and can be assigned with different accessibility level. For example, sales representatives can be set to access only to Quotation module, while finance staff is set to access to Invoice and Purchase Order modules. As Xin Inventory 2.0 supports Multiple Companies, one user can get set to access to different modules for different companies, or even blocked from acccess to certain companies. Xin Inventory 2.0 uses Microsoft SQL Server and the database is opened and under your own control. If the current Report available in Xin Inventory 2.0 is not sufficient to your business needs, you may connect any third party reporting tools to Xin Inventory 2.0 database and generate any report freely. We have customers from Croatia, Mauritius, Maldives, Malta, Cyprus, United Arab Emirates, Saudi Arabia, Egypt, Bahrain, Qatar, Kuwait, Oman, Turkey, Bulgaria, Lebanon, South Africa, Angola, Kenya, Tanzania, Mozambique, Namibia, Nigeria, Zimbabwe, Zambia, Brazil, Barbados, Paraguay, Puerto Rico, Costa Rica, Mexico, Venezuela, Peru, Argentina, Uruguay, Chile, Panama, Aruba, Trinidad and Tobago, Colombia, Honduras, Guatemala, Bermuda, United State (US) and Canada. Oceania country like Australia, New Zealand, Papua New Guinea. Europe country like United Kingdom (UK), Italy, France, Greece, Switzerland, Ireland, Denmark, Netherlands, Sweden, Austria, Portugal, Spain, Czech Republic, Germany, Norway, Poland, Belgium, Luxembourg, Latvia, Georgia, Romania, Finland, Estonia, Belarus, Slovakia, Lithuania, Serbia, Ukraine , Slovenia, Russia. Asia country like China, Taiwan, Macau, Mongolia, India, Japan, Korea, Philippines, Sri Lanka, Pakistan, Hong Kong, Malaysia, Singapore, Indonesia, Timor-Leste, Thailand, Brunei Darussalam and many more. As Xin Inventory 2.0 is an enhanced version from Xin Inventory 1.0, for other features available in Xin Inventory 2.0 and not listed here, please refer to Xin Inventory 1.0 and Xin Invoice 3.0. "It is quite useful and helpful for our company because we are operating Xin Inventory 2.0 network version. There are very powerful template for us to create own design. Especially Thanks to Xin on-line support." "THE XIN Inventory 2.0 is a perfect software for small to medium size company looking for billing and inventory management. The feature to modify templates works very well to your advantage once you learn how to play around. It covers almost every feature you want except that a web based login for using the software and your database over cloud would make this software hard to beat by any other. Also it has been well priced for the multi user logins. I would recommend Xin without a doubt also for their email support where the solution would be in your Inbox within few hours. Great job XIN ."